Video: The GKOS keypad used together with an LCD display. If you are planning to build a stand-alone system where a small but full-featured keyboard is needed, this could be a quick and easy solution for you. Note: The LCD unit is only required for the first sketch. format: _Enter, _Ctrl, _Alt, _PgDn, _Esc etc. How to deal with these depends on your needs. are dealt with by this sketch. lcd.rightToLeft(); // Looks strange but works! working, by showing the text you type on the serial monitor of the IDE (just click to open the monitor). // Initialize Gkos library with pin numbers for keys A to F.
Serial.begin(9600); // Set up Serial library at 9600 bps. by controlling the LED on pin 13. // Key A => "a"
// Key B => "b"
// Add your other code here. // Note that gEntry is always a single character like "a"
// or a keyboard function like "_Del"
In addition to letters, numbers, punctuation and other characters, the PC keyboard functions are indicated as shown on the right. Note that _123abc, _Shift and _Symb are not output as such. Instead, they are used for modifying the characters before they are returned by gkos.entry(). 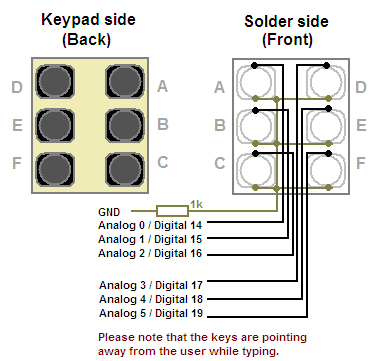 Interested in building a USB GKOS Keyboard for the PC?